The bad news is the succesful brand Kara Coconut Milk has changed. But, don’t worry, it’s only their name. They are now called Koko – which I guess is a sensible move towards greater brand recognition. Better still they’ve added a new flavour. 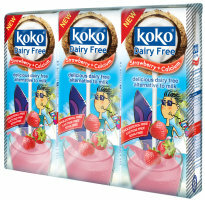 Now you can try Koko Dairy Free Strawberry in addition to their plain Coconut and Chocolate flavours. In case you didn’t know: coconut milk is a great dairy free alternative to regular milk. As a milk it contains 65% medium chain fatty acids (MCFAs), which (unlike saturated animal fats) are not readily stored in the body but are digested and used as energy by the body. Around 50% of these MCFA’s are made up of lauric acid which is the main nutrient in breast milk. Of course, ‘good fats’ should be considered an important part of a balanced diet, as they contribute towards healthy cell function. Next > Beauty secrets for men? Thanks for asking. Plain Koko coconut milk has less sugar than full fat milk, but Koko milkshakes do have increased sugar content.